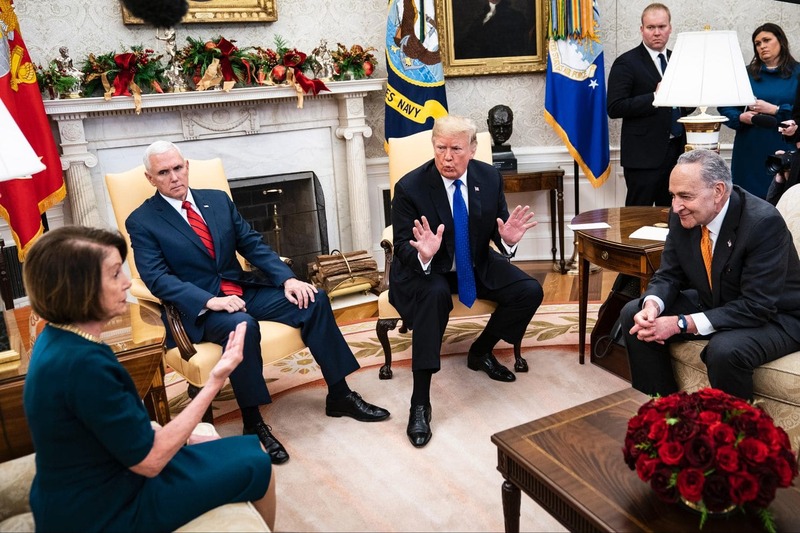 President Trump kept the press in the Oval Office as he met with Democrats over border security and the upcoming change in control of the House. Pelosi said she didn’t want to meet with Trump in open debate in front of the media and in the same breath said she wants Congress to be 100% transparent. 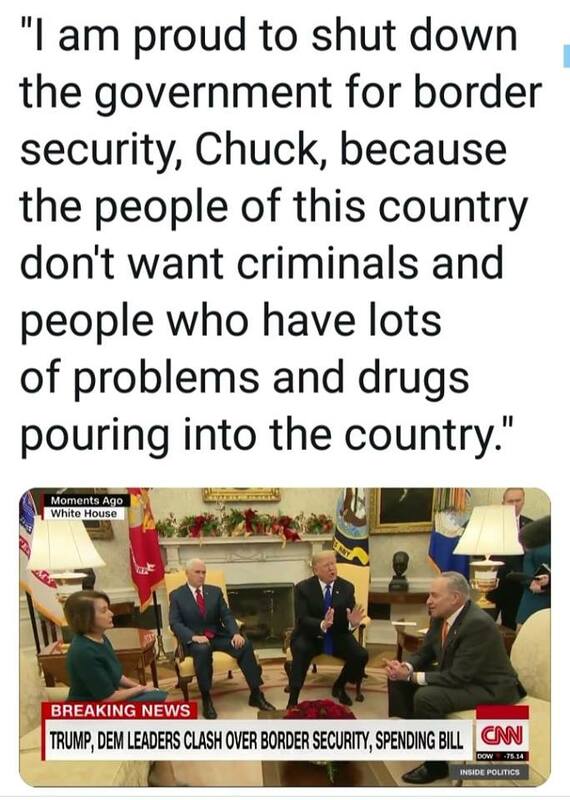 Schumer tried to blame Trump as wanting to shutdown the government when he refuses to fund border security after saying he supports border security. Translation – Democrats are two-faced liars. Democrats have allowed millions of illegal immigrants to pour into the USA including criminals, gangs, and terrorists. As intelligence agencies reveal that over 10% of illegal aliens attempting to enter the U.S. are criminals, and that the border patrol averages apprehending ten known Islamist terrorists a day, Democrats say no one knows who is crossing the border but that there are no criminals and terrorists. If nobody knows then how would they know there are no criminals and terrorists? 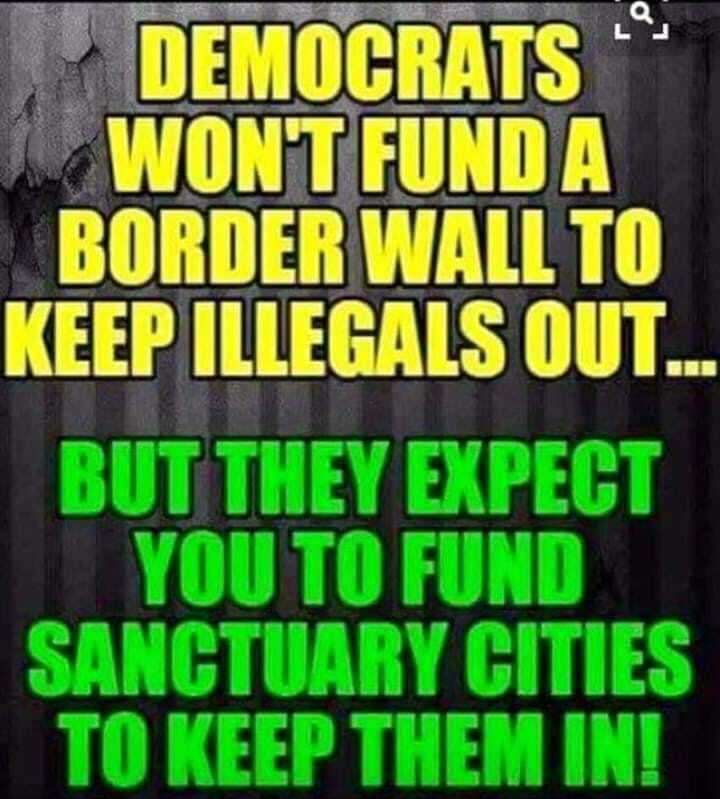 Democrats have openly become a vehicle for criminals to enter the USA and operate against the citizens and lawful immigrants of this great nation. They are importing Latino-communists and Islamo-nazis to join with liberal-fascists in an effort to bring America down from within. This entry was posted in Politics and tagged Border Security, Build the Wall, Chuck Schumer, Democrats Import Illegal Aliens, Donald Trump, Nancy Pelosi. Bookmark the permalink.